Data compiled by the Central Statistical Bureau (CSB) show that, compared to October 2017, in October 2018 industrial production output1 reduced by 1.9 % (according to calendar adjusted data at constant prices). The decline was caused by the output reduction in electricity and gas supply (of 17.7%), however rise was recorded in manufacturing (of 3.3%) and mining and quarrying (of 6.3 %). 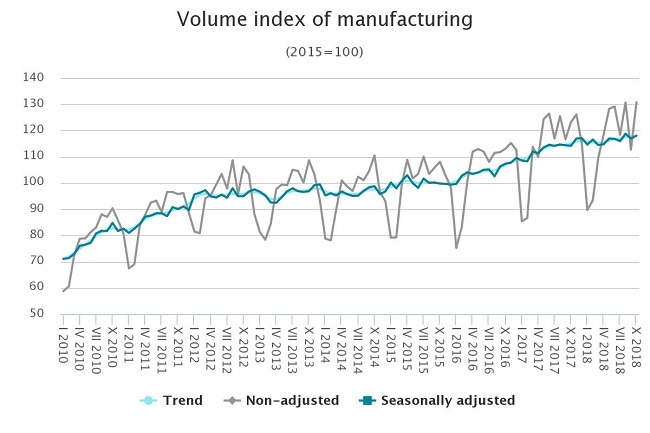 Compared to the corresponding month of the previous year, industrial production output increased in two out of the three sectors having the largest share in manufacturing – manufacture of wood and of products of wood and cork, except furniture (by 6.2%) and manufacture of fabricated metal products (by 2.9%). Output upturn was also recorded in manufacture of electrical equipment (of 20.2%), manufacture of motor vehicles, trailers and semi-trailers (16.8%), as well as manufacture of computer, electronic and optical products (16.7%). In its turn, production output decline was registered in manufacture of beverages (of 8%), manufacture of paper and paper products (7.8%), printing and reproduction of recorded media (7.6 %), as well as manufacture of food products (3.2%). Compared to September 2018, in October 2018 industrial production output reduced by 1.3% (according to seasonally adjusted data at constant prices). Of which output in electricity and gas supply fell by 11.9%, while in mining and quarrying as well as manufacturing there was a rise of 1%. Compared to October 2017, in October 2018 manufacturing turnover increased by 8.6% (according to calendar adjusted data at current prices). Turnover on the domestic market went up by 8.4% and in export by 8.8% (of which in euro area by 13.1% and in non-euro area by 4.7%). Compared to September 2018, in October 2018 manufacturing turnover rose by 1.2% (according to seasonally adjusted data). Turnover on the domestic market grew by 0.8% and in export by 1.5% (increase in euro area of 1.6% and a drop of 1% in non-euro area).